R2005, Patrick O'Connor. Sdlg. 02-04B. 28". Red falls with a purple underlay near edges and an orange suffusion near center. Falls a lighter red. 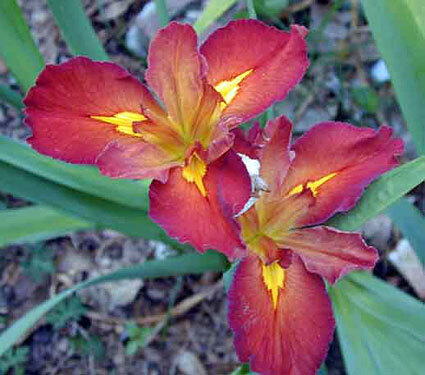 Reverse side of petals is yellow, creating pretty buds with a red and yellow contrast. Bright yellow spear signal. Kelley’s Choice X Prytania. Named for an historically interesting and famous early-1900s red light district in New Orleans.